Looking thru all the circuits, you can see decoders, timers, clocks, drivers, flip-flops and counters. It also Shows how to read and write a RAM 6116, i think 16K. Monostables and Shift Register operations can also be learnt, Study and Build the partial blocks to learn, some chips may not be easy to get. Use Similar in any Logic family. But use one family for one project, don't mix up., Levels may not match. The Security Guard duty monitor below, shown in eight circuits below are examples of logic circuits, i have converted them from the DOS Orcad to Orcad 9 and corrected some errors a few years back. Crystal Oscillators are the Time Base on a wristwatch or a home clock, analog or digital, Mechanical clocks have become rare due to the Maintenance and Accuracy. Some crystals can change dimensions on a electric force, some generate electricity on Mechanical Strain. 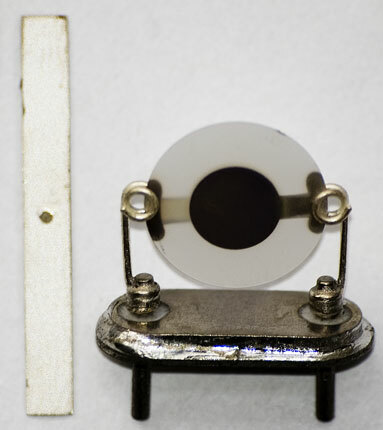 Ceramic Resonators - "The ceramic components are made of high stability piezoelectric ceramics that functions as a mechanical resonator. The frequency is primary adjusted by the size and thickness of the ceramic element." 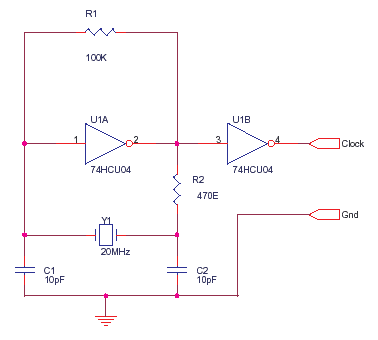 74HCU04 is a chip that was made for this purpose, HCT may not work for such a circuit. C1 and C2 can go to upto 33pF and R2 can be increased to make R2 * C2 = t.
Time constant much less than the period T of the crystal T = 1/F . This is to remove higher frequency components in the Oscillator. The circuit above is a parallel resonant oscillator circuit. The Crystal works by the piezoelectric principle, piezo means pressure. The electric field causes the impedance of the crystal to change. The LP Record Player needle is the reverse of this, the bumps on the spiral groove of the record applies pressure to needle which generates electricity. Both are piezo-electric effects.